Here is the simply solution to open the Start menu settings in Windows 10! From Windows 10, the Start menu settings is no longer in the taskbar, Here is the solution how to easy open the Start Menu Settings on Windows 10 this works on Home and Pro Edition! Please do a right click on an empty place on the Windows 10 desktop and choose the Personalize option! Now the Personalization window opens automatically, in the Windows 10 settings click on the tab called Start. 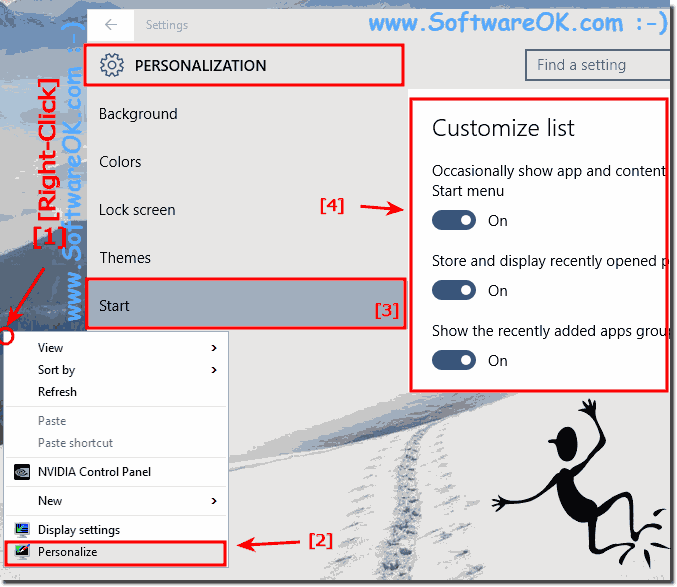 (Image-1) Personalize the Start-Menu in Windows-10! Windows-10 - FAQ-82: Where are the Start Menu settings in Windows 10? Where can I find start settings? Win 10 se startup settings? Where are Windows 7 settings? Where are the settings in the Statmenü? Start-All programs where do I find them?